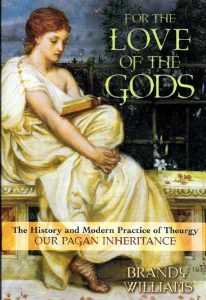 For the Love of the Gods: The History and Modern Practice of Theurgy is both an historical narrative of the ancient traditions of pagan religion and modern spiritual practices. It traces is roots from the Kemet school of divinity in Egypt to the neo-platonists of the 17th and 19th Centuries and onwards. In this review we take a deep look at the spiritual discipline offered as the foundation of spiritual practice and theurgy, and look to the powerful effect of the storytelling technique of presenting the Ancestor/Teachers of this sacred tradition, thought to be lost.